Chocolate Scotch Eggs | What Smells So Good? These Scotch eggs are gluten free, nut free and super chocolatey! Who says Easter is over? No Creme Eggs? The brownies are divine on their own! Ever since one of my co-workers made "real" Scotch eggs for a lesson on the layers of the earth (practical geology! ), I've been fascinated with the sweet version. The combination of Creme Eggs and brownies has always been more palatable to me than the traditional deep fried hard boiled egg / sausage concoction - I am not a fan of eggs in general, and hard boiled eggs and I have never gotten along well. Creme Eggs, though, were my kryptonite every Easter as a kid - I would find exactly 3 "regular size" eggs hidden amongst all the other "standard" milk chocolate eggs and knew I had to make them last. This was an issue because back then, Creme Eggs really were only around until Easter, when they disappeared for another 11 months. It was definitely a bittersweet experience, especially since Easter usually coincided with either my sister's, my dad's or my birthday, meaning that we got less candy from the Easter bunny because "he knew we'd get lots of chocolate from home". Eventually, not only was the Creme Egg "season" extended beyond a month, but Cadbury started coming out with miniature versions of their super-sweet classic. The great thing with the mini eggs was that you didn't get a massive sugar rush after having one or two, but they still killed that craving. Even better was their texture when frozen - the fondant melted slowly and completely rather than getting caught in the back of your throat, and it took longer to eat them so they lasted longer. When I found a bag of the British version (sorry, they're better) in with the "last chance before Easter" bin at the store, I snapped them up with the sole purpose of turning them into Scotch eggs. Some of the recipes I had found online called for full-size Creme Eggs to be covered in the brownie "cake pop" dough, but that just seemed extremely excessive - I, a bona-fide Creme Egg (and brownie) lover, would never be able to finish one, so I was not about to expect others to! 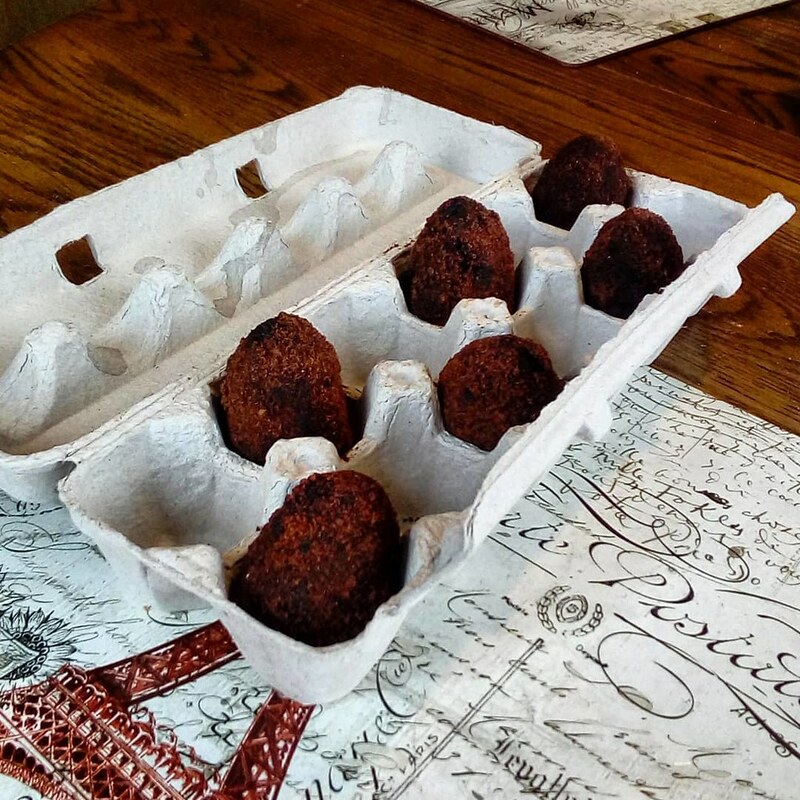 The mini eggs, once covered in the brownies and graham crumbs, fit perfectly in an egg carton and were a perfect dessert size. As I was making them for a gluten free friend of mine, I was thrilled to find that the UK Mini Creme Eggs are GF (sorry, domestic CE, you need to step up your game). I whipped up a batch of basic, cocoa-based GF brownies and got to work. They looked fairly close to "real" Scotch eggs (smelled a lot better though) and the brownies that didn't become coating were enjoyed by two of my other pals. Even though Easter was over, and it was my birthday party, I couldn't think of a better way to celebrate! Do you bake or cook for others on your birthday? Crumble brownies into a bowl and add just enough milk to form a dough like consistency. Take a portion of the dough and form a shell around one creme egg, forming an egg shape. Roll in graham crumbs and set aside. Repeat with remaining eggs and brownie mixture. Preheat the oven to 350 °F and line an 8" pan with parchment paper. In a large mixing bowl, whisk together the cocoa, salt, oil, milk, sugar, and vanilla extract. Beat in the eggs one at a time, followed by the egg replacer and flours. Bake for 26 - 28 minutes or until the brownies have formed a thin crust and appear set in the middle. Cool completely.